The official City of Toronto bake oven information page is here. It appears that Parks management has made a new rule -- that all ovens must have an engineer's stamp. For this reason, only small pre-stamped pre-fab ovens have currently been approved for installation. Publicbakeovens recommends that community groups not try for such ovens, since they don't work well in public spaces. This has not been stated directly, but the evidence seems to be there. 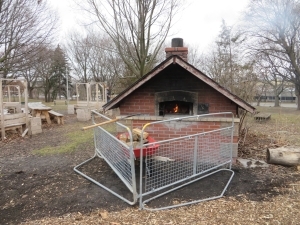 For example, at Christie Pits the original oven, which was in good repair, was removed from its place in the fall of 2015 and placed at the side for apparent disposal. 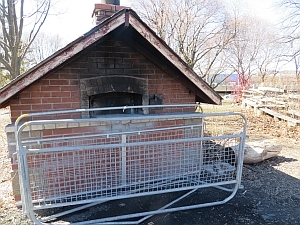 After some discussion, the oven was put back beside the footings for a new prefab oven. See Christie Pits oven correspondence. In the case of Christie Pits the new oven was not small (although the actual hearth size was not much bigger). But the oven was imported from France and a large housing was made for it, Final cost: $161,000. New rule: when there's a fire in the ovens, they have to be blocked off. 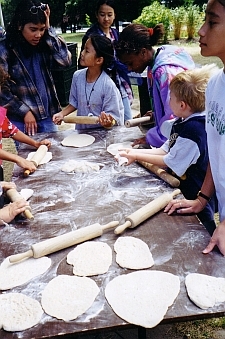 Effect: On a bread baking day, the bakers have to tend each oven around 10 to 15 times per oven and per firing. That amounts to 20 to 30 times per oven per firing for the two ovens. That adds up to 40 to 60 times of the bakers moving the barricades on Wednesday and 40 to 60 times on Thursday. In addition to that they have to set it up - moving 2 heavy barricades to position them in front of each oven, and afterwards to put them away again. Note: this new rule appears to be modeled on the Riverdale Farm oven rules. That oven no longer has public use. The city carpenters devised rather ingenious gates, made of wood, with nice hinges in a barn style. The barriers could themselves catch fire if there were sparks (which there are not), and during baking the gates are left open to give the bakers access -- which means that when there's an active fire in the oven, anyone could still put their hand in the fire. Happily, people don't do that, not before and not now. And the wooden barriers look so much nicer than the metal ones. 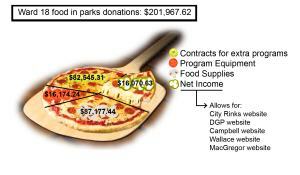 by the Parks and Environment Committee -- to charge fees to baker volunteers. Here's our deputation (it fell on deaf ears). Here's our earlier response to the city's bake oven policy. It's in the same format as the policy so that the two documents can be compared more easily. Our approach was to maximize community oven use and stress the need for a collaborative relationship between City staff and bake oven users. This version was not accepted by staff and therefore not considered by the Parks Committee. 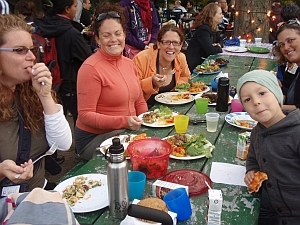 "City Council direct the General Manager, Parks, Forestry and Recreation, in collaboration with the community representatives, local stakeholders and councillors, to report back to the Parks and Environment Committee two years after implementation of the policy on how the details of the permitting, fees, construction and operations are working." We have asked the Parks and Environment Committee whether this report has been scheduled for the December 6 meeting of the committee. No answer. Note: the new oven installation policy prohibits building bake ovens near ice rinks. That makes the Dufferin Grove and Scadding ovens illegal. 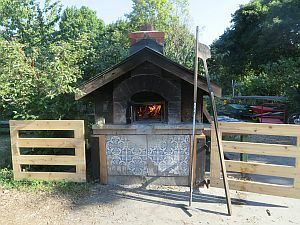 The Thorncliffe Tandoor oven was finally installed and used in the fall of 2013. There was NO oven policy follow-up in 2014 at the Parks and Environment Committee. Most people are thrilled to discover a bake oven in a city park -- perhaps glowing with a well-stoked fire, perhaps loaded with fragrant bread. They find the fire beautiful, the food delicious, and the chance to meet their neighbours a treat. However, as the documents linked below indicate, people who want to use existing ovens, and people who wish to build permanent or temporary ovens, have faced an increasing number of regulatory obstacles. Reason: so that no one can jump inside. Sept 25, 2008 (Alan Christie) City's not fired up about ovens in parks. Feb 25, 2010 (Catherine Porter) Porter: City crackdown hits park pizza nights. May 21, 2010: (Catherine Porter) Why is it so hard to get a bake oven in a park? May 31, 2010: (Catherine Porter) Changing Lawrence Heights with a pizza oven. See the "Correspondence" link above for some details about Riverdale Park, Alexandra Park and the proposed Stonegate oven in Bell Manor Park. 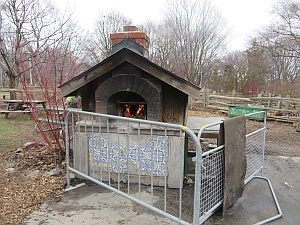 A letter outlining the issues with the Alexandra Park oven. 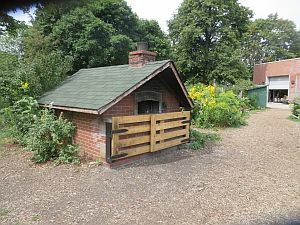 A chronology record of email correspondence related to the Stonegate Community Health Centre's proposal to build a bake oven in Bell Manor Park.